So a little horn blowing... Over the weekend, my LEGO club, GFLUG, had a display at MegaCon in Orlando, FL. It was crazy fun to say the least. Anyway, for the show, I decided to add something to the LEGO gaming area -- my version of LEGO Pirate Battleship. 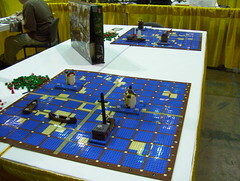 I wanted it to be table top sized and micro-scaled... so two people could sit down and play it and lots of people could stand around it to watch. The size was right, but the micro-scaled didn't happen -- ran out of time to build between work and life. Anyway, it was functional -- a few kids had fun playing it.